Tom from the Peloton sent this link to a funny movie. It shows what happens if you are a cyclist and asking your wife or husband if you can go out for a ride. There is also the follow up movie of what kind of discussions you might encounter after your bike ride. There is construction across from my shop so I assume there will be a new shop. 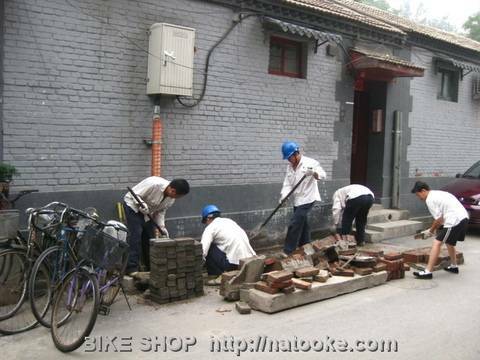 I asked one of the guys from Wudaoying hutong and he said that someone wanted to open a bike shop but he did not allow that. As if I were to believe that. Does he really think that could frighten me? Having a bicycle shop in Beijing makes you get the interesting as well as strange people come in suggesting various things. Especially Chinese people surprise me. I have been asked if I sell flags of various countries, or if I can help get some antique model trains from Germany. Advice has been to give my customers good customer service by requesting them to come back after 3 months and then open all the bearings and grease them so that they do not brake after 4 months. That would probably be a good idea if I were to sell the mass produced cheap low quality bikes that you get everywhere in China. A funny similar suggestion was to provide service to the elderly bike riders to repair their old bikes for free so that they like coming and then will buy a bike from me. That would be so funny of all the over 70 year old Beijingers would start riding flashy fixed gear bikes. I am happy the old cyclists already come and chat with me just because they know I love bikes and especially nice old ones. Another great suggestion was to do advertisement in the newspaper to get children to start the sport of trick cycling. That would be wasted money, I prefer to continue to perform in schools and show the children what trick cycling is and see if someone is interested. Another funny suggestion was to hire the Chinese cycling acrobats (that just stand together on one freewheel bike) to get more people interested in fixed gear bikes. Ha ha. But a good suggestion of one of my Chinese friends was to find people to work for us. We are currently looking for an intern to help us with our website and office stuff. But we also are looking for a fixed gear bike mechanic or someone that wants to learn about single speed bikes to help us build up all the bicycles. Of course an intern is welcome. If you know someone that could be interested just contact me. 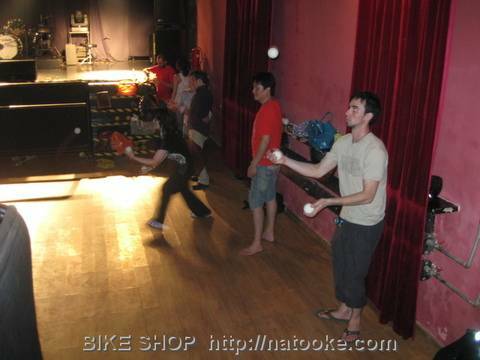 Tonight I went to the Beijing Jugglers meet up in Yuging Yishan bar. It is a bit dark but it is great to be able to use the space for free. It is great to see that the group is growing and attracting beginners and professionals at the same time. It is really fun as everybody helps each other. 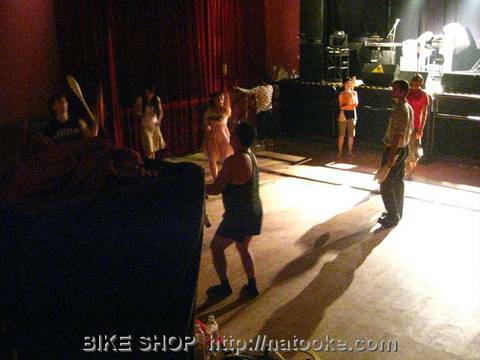 This entry was posted on Montag, Juli 19th, 2010 at 23:19 and is filed under Fixed Gear, Juggling. You can follow any responses to this entry through the RSS 2.0 feed. Both comments and pings are currently closed. That they offer you cozy sleeping and then the overall flexibility for Cycling shorts! It span you are likely to locate maxi clothing all over the place to suit.